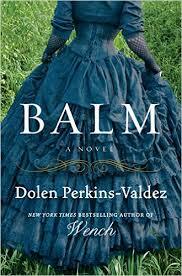 Dolen Perkins-Valdez’s New York Times bestselling novel Balm follows three African-American characters who have moved to Chicago after the Civil War. One of the clearest examples you’ll ever see of the distinction between story-advancing information and details that should be quickly summarized can be found in Dolen Perkins-Valdez’s novel Balm. You can read the opening pages of the New York Times bestseller at the HarperCollins website. Hemp got work loading ship a week later and earned his first wages as a free man. He bought a sack, shoes, pants, but even his first paying job could not help him shake the sadness. He asked everyone he met, but no one knew of a woman fitting Annie’s description. He decided it would be better for him to stay in one place. It did not make sense for both him and Annie to be moving around. Before the month was out he knew that as nice as Mr. Jenkins was, he could not go on sleeping in that tight, dark room. While the novel dramatizes and puts in-scene the initial conversation with Mrs. Jenkins, it summarizes a month of conflict: Hemp’s search for a job, his fruitless search for his wife, and his decision to find a new place to live. All of that could have been the subject of engrossing scenes, yet Perkins-Valdez summarized it. Why? The answer could tell us something about what is important in a story. In this case, what was important was establishing the characters, their voices, their desires. Once we understand those things—once we get a feel for the characters—we don’t need to see their every move. We intuitively understand how those summarized scenes might have played out, and we can skip ahead to another pivotal moment. Choose a pivotal moment in your story. By pivotal, I mean that someone acts, something changes, or a decision gets made. Our usual approach is often to put this moment in scene, but we’re going to try a different approach. Find or create an interaction that occurs before the pivotal moment. As in Balm, the interaction can be between two characters: a conversation or any moment that requires the characters to work together or against each other or do something at the same time. But the interaction can also be between the character and an object or place: think about Jack London’s famous story “To Build a Fire” and its scene with the man interacting with the wood that he’s trying to burn. Use that interaction to show off a character. The scene from Balm could easily come with a title: “This is what Mrs. Perkins is like and how newly-arrived Hemp reacts to her.” All of the dialogue and descriptions (“narrowed her eyes, wrinkling a scar”) actively build our sense of Mrs. Perkins. Hemp’s simple dialogue (“Yes, ma’am”) does the same thing. The goal is to give the reader an understanding of who these characters are. Once we have that, we will usually understand their actions. So, choose a moment that allows you, through dialogue or action, to show off the characters, to give the reader a sense for who they are. Give the scene purpose. In Balm, Hemp is looking for a room and for his wife. He’s not simply shooting the breeze with Mrs. Jenkins. In your scene, something needs to be at stake. The stakes can easily be resolved, as they are in Balm: Hemp gets a room but doesn’t find out anything about his wife. Not every scene needs a pulsing, Hans Zimmer drumbeat in the background. But every scene needs a reason to exist. After the scene is over, summarize the pivotal moment. Balm summarizes Hemp’s search for a job and his wife and his decision to find a new place to live. After seeing his conversation with Mrs. Jenkins, we can imagine him doing these things, and so it’s not necessary to show them. In the same way, you can dramatize a character-building moment and then trust that the traits you established will be clear enough to make sense during a quick summary of events. The goal is to build a story that relies more on character and voice (which are inherently interesting) and less on minute-to-minute action (which can become tedious).